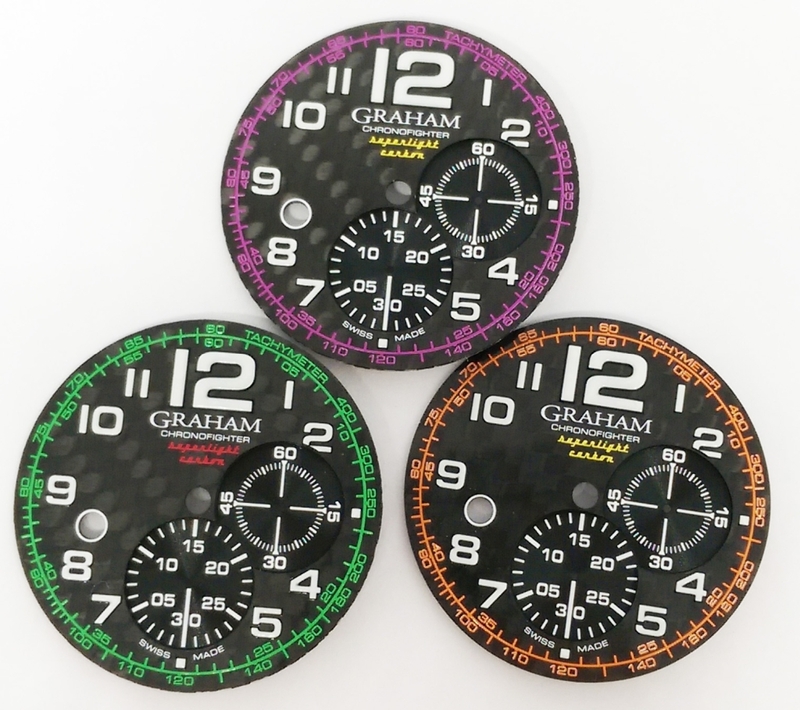 Based in La Chaux-de-Fonds, Switzerland, Graham is an independent brand specializing in chronographs. The brand manufactures contemporary watches using the most modern technologies and materials, with a vintage aeronautic touch. 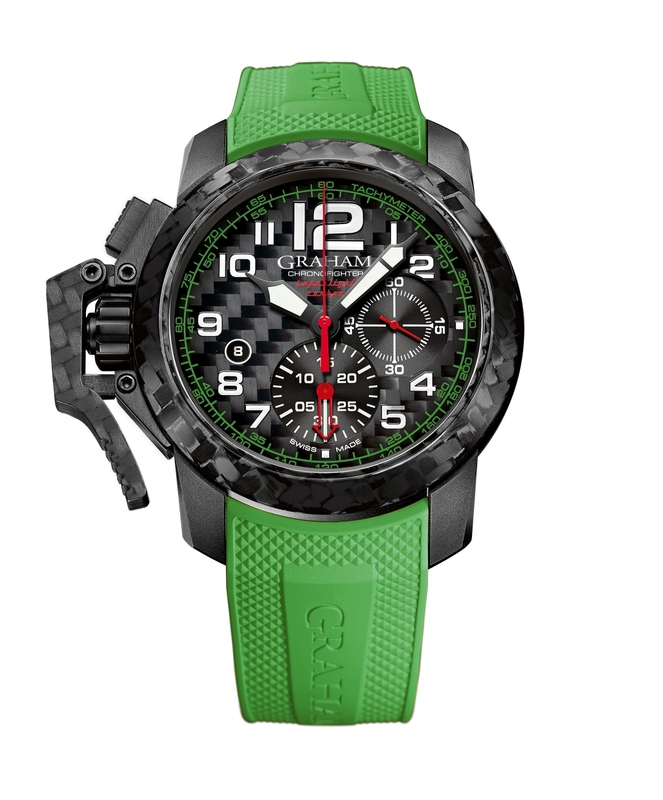 If we look at the limited Holidays Series, the Graham Chronofighter Vintage Nose Art Ltd, or an ultramodern design, like the ultralight (less than 100grams) Graham Chronofighter Superlight Carbon. For the beginning of this year, Graham comes with a coloured move, the Chronofighter Superlight Carbon with shaded variations – True Colours. The brand with petrol in its veins and style on the brain presents timepieces that fuse superlight carbon technology with supercharged looks. We are already accustomed to, the Chronofighter Superlight Carbon comes in a relatively large carbon case. But as we remarked in our review, short lugs and the carbon case, pusher and buckle make the Chronofighter wear smaller than expected. The polished 3K black carbon fabric texture bezel looks amazing and contrasts nicely with the coloured elements of the dial. The new straps variations permit an effortless accessorization to the quotidian life. 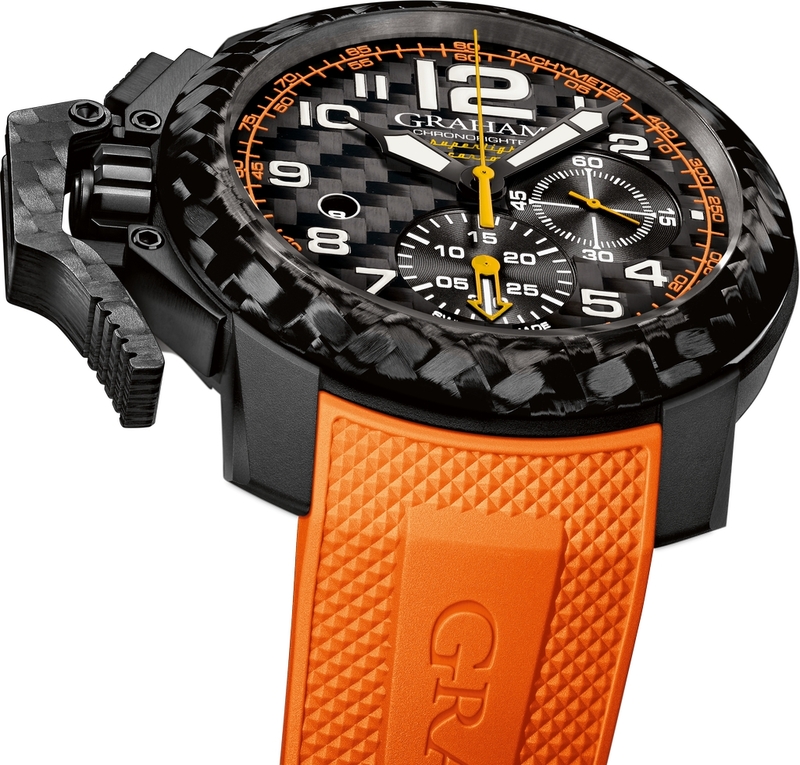 The new Chronofighter Superlight Carbon draws its inspiration from the Formula One. Graham has a strong affinity not only to aviation but also motor racing. The independent brand sponsored the Brawn GP Formula One team from 2009 to 2011, preceding the partnerships with the Swiss Porsche Cup, the Isle of Man Tourist Trophy, the Baja 1000, the GT Asia Series, the Spengler Cup, Silverstone circuit, the Swiss Gurnigel Hill Race and the Club Porsche Romand. Graham Chronofighter Superlight Carbon True Colours has many ideas and implementation in common with Formula One. Carbon, an lightweight material is used to manufacture watch, allowing it to weigh a scant 100g. 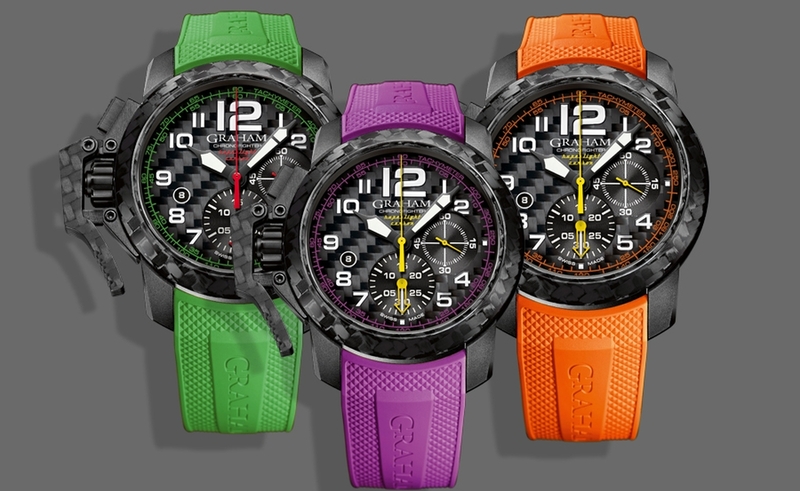 The “Clous de Paris” patterned coloured straps remind of the Formula One’s coloured tyres and the pace cars present on the circuits. 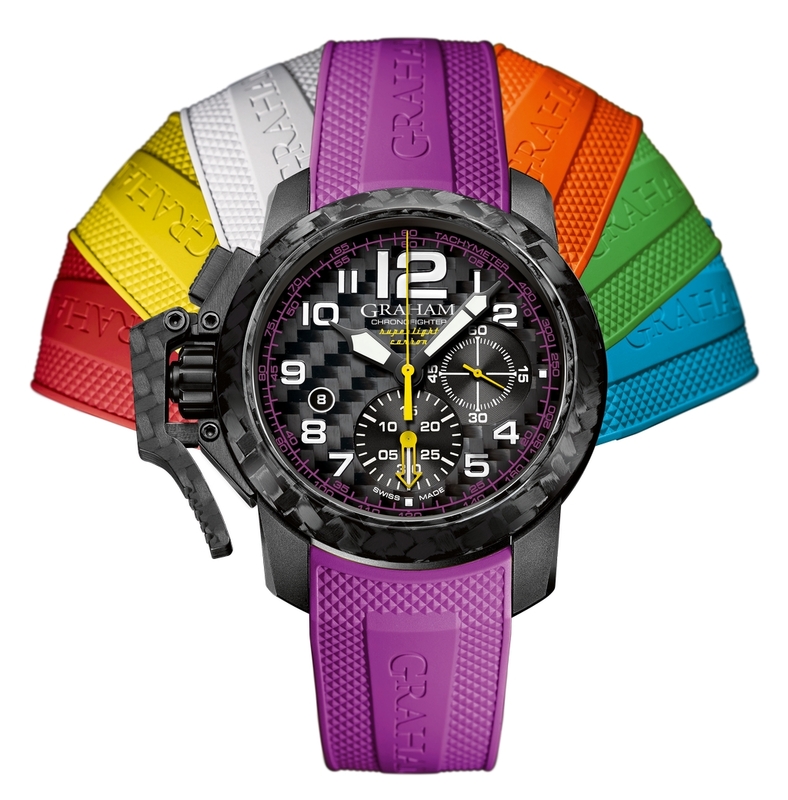 The purple version of the Chronofighter comes carbon dial with purple printing for the seconds chrono’s track, with yellow chrono and small seconds hands. The integrated strap comes in purple rubber strap with “Clous de Paris” decoration. Ref. 2CCBK.O01A comes with orange dial printing and the same yellow themed hands for the chrono function and the small seconds. The rubber strap comes with a nice orange rubber strap. Graham Chronofighter Superlight Carbon True Colour Ref. 2CCBK.O01A conveys anticipation – an important characteristic in motorsports. The Green version of the Chronofighter is decorated with green printing for the chrono second’s rail-track and with red hands for small seconds and chronograph function. For more information, please visit the Graham Website.